After all, I’m a traditionalist when it comes to wine. Give me the sturdy 750-milliliter bottle with a real cork in it, and I’m happy. I know my ground. Wine in a box, I can see the value, but wine in a can seemed like a marketing ploy, a gimmick to draw the young and the hip; people who drink wine through a straw and such, not real wine drinkers. However, when the cans started showing up in greater numbers in Vermont and New Hampshire in the last few months, somebody recommended I try them. I followed the advice and bought three brands that seemed promising. OK, I was wrong on just about every count. The wines I tried are crisp, dry and refreshing. They are excellent for picnics, outdoor events and other summer activities. They also go well with lighter summer and grilled fare. Canned wine apparently is not a trend. Sales have grown so fast over the last four years, that it has become a category. Wine in cans has been around for a couple of decades and have been produced in the United States since early 2000. What’s changed is the popularity of the product. Aluminum cans are easy to chill and carry to places where bottles aren’t convenient. They, too, have a smaller carbon footprint than bottles. Figures published by the Container Recycling Institute show that aluminum cans are recycled at more than double the rate of glass containers in the U.S. The Francis Ford Coppola Winery produced the first American canned wine with the Sofia line of 187 ml. (one-quarter bottle) aluminum can minis, but the guy who gets a lot of credit for its current popularity is Ryan Harms, the founder and owner of Union Wine Co.
Union Wine launched the Underwood label, a premium wine, in 2014 in some bottles but mostly in 375 ml. cans, equivalent to half a bottle or 2.5 glasses, ranging in price from $6 to $7. The canned wine accounts for about 55 percent of the company’s 448,000-case business. Harms told the Milwaukee Journal Sentinel this month that the company produced 4.2 million cans last year, and Union Wine now has 35 percent of the total market share. “The wines we can are the same exact wines we put in the bottle. The cans are lined and permit no effect on the taste or interaction of the wine with either the lining or the aluminum,” he said in the article. Union has just completed the construction of a new canning and bottling plant that will be able to produce 600 to 650 cans a minute, perhaps fast enough to keep up with the market growth. 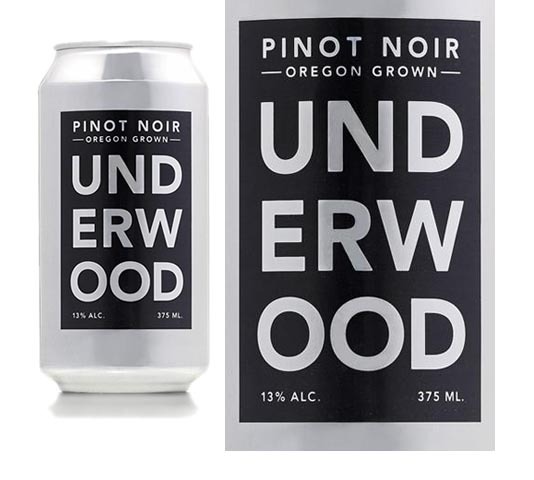 I tried the Underwood Pinot Noir, and it was far better than Pinot Noir you can find for $12 a bottle. The wine is made from grapes grown from three areas of Oregon, aged in oak for eight months and has flavors of cherry, spice and black currant, the tasting notes say. Underwood cans are widely available in Vermont. I found them at the Bethel Village Sandwich Shop. Also showing up on the Upper Valley market is Lila Rose, from southern France. Sold in a four-pack of 250 ml. cans — 33 percent more than a bottle — the wine, which is produced by Boston-based Latitude Beverage, is refreshingly dry, with lots of fruit flavors. This is an excellent value and a fun wine to drink. Bollicini Sparkling Cuvee is an excellent dry white wine with lots of flavor. Its origin is a bit more mysterious than the others. The wine is made from grapes — I’m not sure which ones — that come from a region in northern Italy known for Lambrusco and Malvasia. It’s made by a cooperative and sold in 187 ml cans or a healthy glass of wine. The four-pack equals a bottle. That’s about all I know, except that it’s very good and a bargain. Check it out. All of these wines are great to try on a hot summer day, and they are not just for millennials. Seventy year olds have been reported to be seen drinking them on the golf course. I was wrong about canned wines, and I will continue to drink them, no matter what my traditionalist wine friends say. Also included in this review: Lila Rose, 12 percent alcohol content Provence, France, $11.99/ 4 pack and Bollicini, Sparkling Cuvee, 11 percent alcohol content, Fidenza, Italy, $10.99/4 pack.